If you're subscribed to the Onion Newsletter, you might already now that the Onion Cloud is up and ready for all Onion users!! We definitely suggest that you sign up to the newsletter to receive Onion related news and updates. The Newsletter is an email that goes out once a week containing an update on what's new in Onion-land, a featured tutorial or project, and a Deal of the Week. We've been working very hard on the Cloud and we're very proud to finally open it up to all of our users. Since the Cloud is hosted on our servers, we will be doing rolling updates so don't be surprised to see new features when you log in! You will need to update your Omega to firmware version 0.1.1 in order to connect it to the Cloud. Hope that helps reduce the trouble reports. @Guest Users don't need an upgraded Omega to check out the Cloud, but they will need to upgrade if they want to connect their Omega to the Cloud. This fact is mentioned here and in several places in the tour of the Cloud. Seemed a pretty logical progression to us here at Onion HQ. So long as HQ is not getting calls concerning this noted step, kudos. I'm able to log into the onion cloud and go to the device manager. I watched the tutorial but adding devices doesn't work. When I try to add a new device I get a popup asking for name and description and I hit Create, popup disappears but no device is listed in the table. Am I missing a step? @Pipo Ok, we'll make sure to look into that! I had some difficulties with Linux/Firefox. The Messages are displaying on the top right corner and hide the menu. So "Add Setup Code" was not reachable. A other issue I have when i click with Linux/Chrome on the my devices cloud (on the right half of the blue cloud) when I'm online. I get the "new device" dialogue, instead of "my device" opened. I read that some people had difficulties to follow the instructions the onioners made (incl. the blue bullet infos). So here are my view steps I made to add a device. Hope it helps newbies. Before you start to use the cloud, please update your device, that you have the full functionality of it. Connect to the cloud.onion.io preferably with Google Chrome. Navigate to the "Device Manager"
Add name and comment for the Device. Save the information to Create this device. Click on the Device again, and click on "Setup Code" on right top corner. Navigate to the Omega (local address) and open the "Settings" Icon. On the left side click on "Cloud Settings" (just visible with newest firmware). Add your setup-code in the field, you copied before in the Clipboard, and save it. 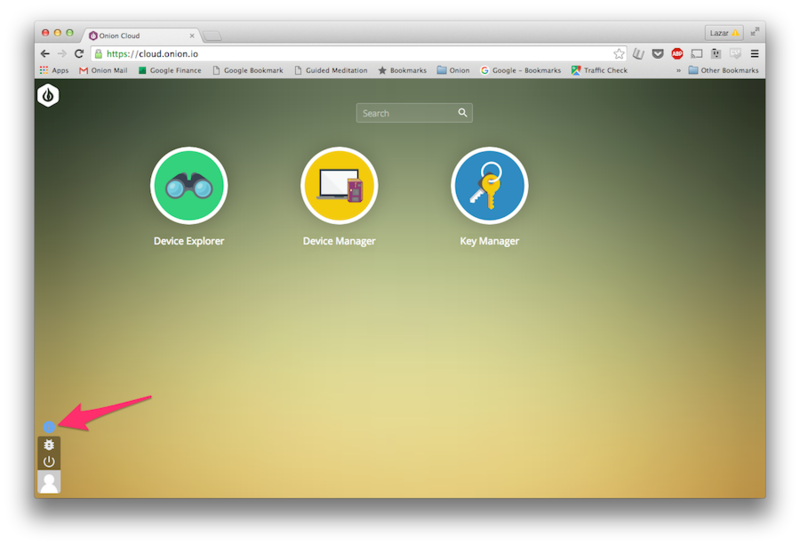 9.1) If you get wrong Setup Code, refresh cloud.onion.io navigate to the "Device Manager" again, refresh the "Device Secret". Re-open "Setup Code" and copy and paste the new one locally, and save it. Your done if you see the "Device ID" & Secret displayed. We've been listening to your feedback (and reading the submitted bug reports), and we've been working hard to improve the Cloud. There is a variety of visual and usability changes that we hope will make you fall in love with the Cloud (even more). And we've fixed those pesky bugs making life hard in browsers other than Chrome. You will now be able to use Firefox and Safari without any issues! Be sure to tell us what you like/don't like and keep submitting those bug reports if you have an issue!